How does one imbue a soul, or a sense of place to a virtual space? Is it the same thing that turns an ordinary cardboard box into an impregnable fortress? Or does it require a meticulous eye and a deft hand to craft? I’m unsure of the answer myself. I have been thinking about worlds these past few days. Two kingdoms have commanded my attention in particular. Those of Boletaria and Lordran. There has been a great amount of praise showered onto both Demon’s and Dark Souls, and a large reason for this has been the worlds that Miyazaki and his team at From Software created. They are awe inspiring in their breadth and their minutiae. Often times it is Dark Soul’s Lordran which is touted to being best and most realised world in the series. This goes some way in explaining why people regard it as the superior game. Here I will lay out why it is Boletaria and its outlying territories that present a more realised world overall. When the two games are inevitably compared it is not uncommon to hear that Lordran is considered a better space because it is a unified entity. All of its areas lead into one another with nary a loading screen in sight. It instils the player’s journey with a transitional element and there are a number of times when you can look up at a distant bridge, or down into a valley and trace your journey. Everything in Lordran is interconnected and forms a singular body. A criticism levelled at Boletaria is that it lacks this unifying relationship between its locations. The player begins in a hub area called the Nexus. From here they choose to access one of five arch-stones that act as portals to the game’s levels. However all that is required to see this is not the case is a simple change of perspective. 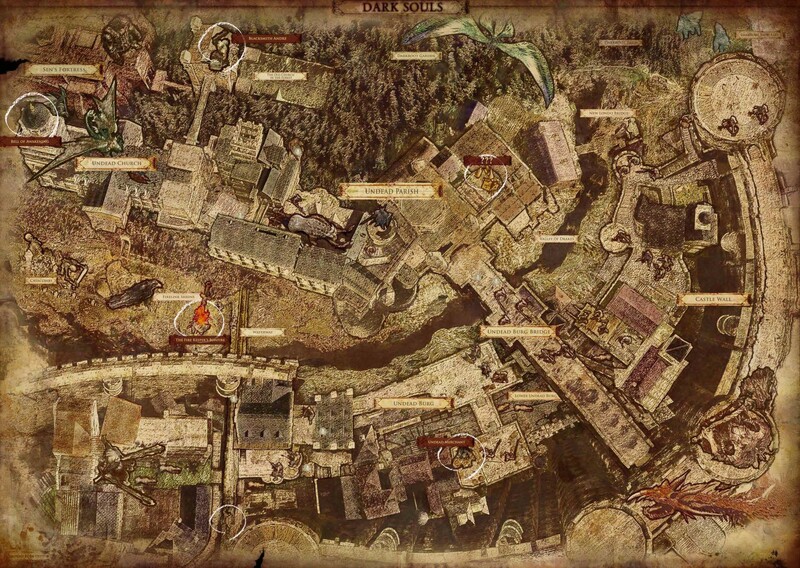 All of the areas in Demon’s Souls are very distinct from one another. The player can hop from the utilitarian and militaristic façade of the Boletarian Palace, to the grotesque filthiness of the Valley of Defilement. This in a way supports a view that purports it is just a group of levels tied to a central point. Demon’s Souls narrative takes place on a much grander scale than Dark Souls. Here we have a colourless fog that has swallowed both the player, the locations available for traversal and half of the entire world at large. The Boletarian Palace sits at the centre of the kingdom. Latria is in neighbouring lands, most probably a vassal state. Look east from the Boletarian Palace’s entrance and a mountain range is visible. This may be the location of Stonefang tunnel, which we learn was under Boletarian control. The Shrine of Storms is an island, far off in foreign lands, home to a different culture and people. So you see Demon’s Souls represents a world as it should be, vast and unconquerable. We ourselves inhabit our own slices of the world in much larger nations, or even cities. I have within Glasgow my frequent haunts. There are parts of this city I have never been to, nor shall I ever go. Scale this to encompass all of Scotland and the number of places I have seen is incredibly small. The whole of the UK? infinitesimal. 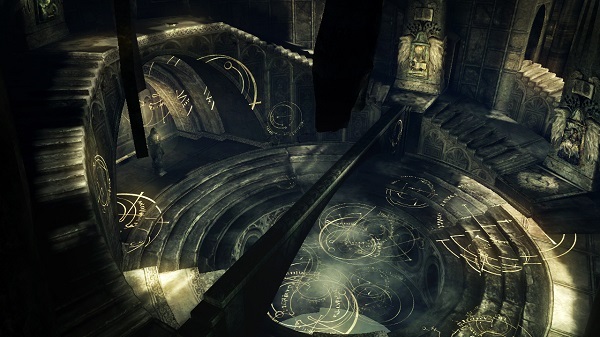 We do not need to see the spaces in between the levels in Demon’s Souls to know they are there. It would be impossible to explore it all. It certainly would not aid our quest, but by learning about the relationships these places hold in relation to each other within the world, we can begin to fill in the blanks ourselves and paint a complete picture in our mind’s eye. Even though there are these gaps Demon’s Souls feels more realised. It feels like a world, and the levels fill in the smaller details that show it was populated with people who had lives, routines and beliefs. Dark Souls, for all of its design flourishes does not achieve this. Lordran feels like it was specifically designed for a player to explore. Players stumbled blindly through Boletaria, grasping at any information that could be uncovered by an item or a corpse. Boletaria did not care that the player was there. Its inhabitantas lived and died here. You, who has travelled far to reach the cursed lands are a trespasser. This indifference is accentuated by how you would repeatedly hop from one archstone to another, exploring multiple possibilities on how best to progress, always searching for the path of least resistance. Lordran gives the illusion of free reign, but through a number of obstacles and design flourishes leads players on a rather set path with only a few deviations along the way. The order in which you tackle the segments in Demon’s Souls presented a much more flexible and even personal story for players to pursue. Darks Souls delights in winking and saying “hey, look how far you’ve come. Remember that place up there? You’ve come a long way.” It is altogether too perfect. The imperfections have been ironed out to the point that is an almost clinical space in which to explore and commit violence. We know that the age of fire is coming to an end and the world is experiencing a great deal of turmoil, but our isolation within the boundaries of Lordran cut players off from all of this. 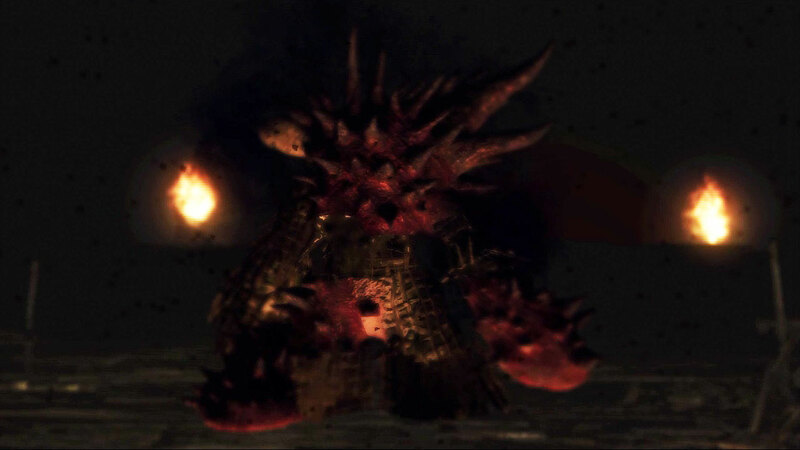 This is brought into focus when you consider Dark Soul’s cast of boss demons, which are very much a highlight of the game. For the most part I adore the boss designs. Sif the wolf, the Gaping Dragon, Pinwheel et al. They’re wonderful monstrosities. Yet there is an inescapable feeling that Lordran has been built not as a world, but as a space to specifically house these demons. It’s al most as if they were created first and then the designers had to figure out where to put them all. Why does the Taurus demon hang out on top of a tower and along some ramparts? The Capra demon calls a small arena home. Does it spend its time gardening and playing with its dogs when the player is not around? Yes they are spectacles to behold but they feel more like obstacles put in place to trounce and challenge the player than entities that are deeply entwined with the history of the place. Compare this then to the demons of Demon’s Souls. For the most part they fit within the fabric of that world in an almost natural manner. In the Boletarian Palace the demons are the expressions of might through specific aspects of once heroic warriors. In the Tower of Latria the demons focus on aspects of control and manipulation while the beasts within the Shrine of Storms are physical manifestations of the ancient pagan myths held by the people of that land. When a player has traversed the rickety and makeshift structures in the Valley of Defilement they are confronted by a creature known as the Dirty Colossus. It is composed of filth and debris. It does not require any great mental leaps to imagine the rotten structures you have just navigated, disintegrating and floating downstream into a standing pool. Here the evil has taken hold and has created a monster out of the flotsam and decay that makes up the core of the valley. Everything in Demon’s Souls is tightly linked, so much so that you could argue that one thing could not exist without the other. The bosses in Demon’s Souls are interesting to examine as entities within their world. Conversely the demons in Dark Souls favour an examination of their relationship to the player. When we place something like the Gaping Dragon under scrutiny we can recognise it as a great piece of visual design, that conjures up some pretty terrifying notions on sexuality, but do we know why it exists? Or more importantly, why the player encounters it in a sewage system under the city?